Whether you love, hate or are indifferent to Trader Joe’s, its model is distinct. According to TJ’s website, the business cuts costs by “putting innovative, hard-to-find, great-tasting foods in the Trader Joe’s name.” Although I purchase the bulk of my groceries elsewhere, I pop into their Boulder, CO store occasionally. I’ve discovered that their house brand hummous beats other prepared kinds and their organic arugula is a steal. At Passover, they sold kosher Matza for a stunningly low $1.99/box. 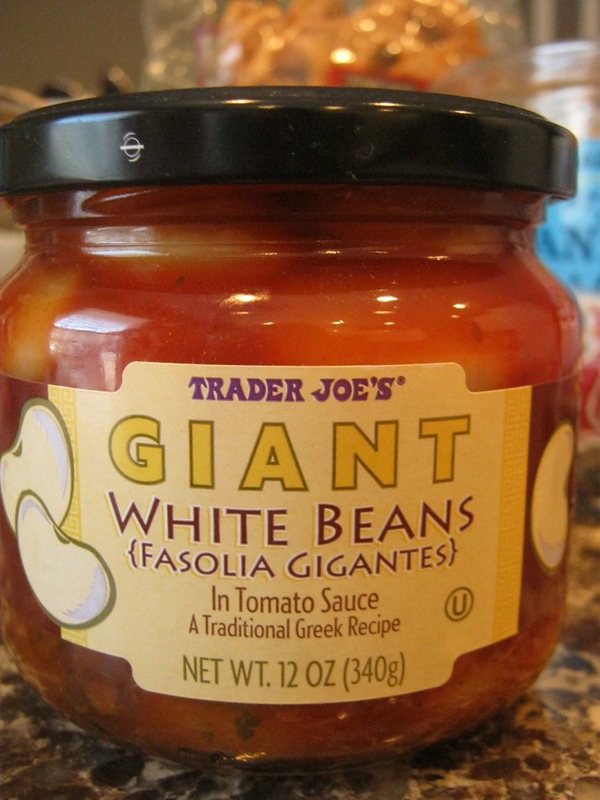 In mid-April I came across jars of Fasolia Gigantes (beans) in tomato sauce, a traditional Greek recipe according to the label. Always looking to add protein and variety to my pescetarian diet, I took one jar from a full shelf, thinking I’d get more if I liked it. The beans, smooth and melty, with a bit of zing from the sauce, pleased my palate and comforted my soul. Versatile, the beans added a delicious contrast cold in salads for lunch and heated alongside fish at dinner. If food were a lover, these beans were a candidate for a longer term relationship. I returned to Trader Joe’s a few days later, specifically to get more, only to discover that same section of shelf empty. Had there been a gigantic run on Fasolia Gigantes? I asked an employee if there were more. She took the tag from the shelf and went to the computer to check. Now there were none. My monkey mind started in: You should have stocked up! As if the Fasolia Gigantes were a life saving elixir, and now I would perish. Still, I felt slightly disoriented, as if I had been stood up. I realized that, despite my awareness of Trader Joe’s policy (“If an item doesn’t pull its weight in our stores, it goes away to gangway for something else”), I had expected the beans would be there at least within the same week, unlike seasonal produce or holiday items. In the checkout line, I realized that maybe the best, if not only, thing Trader Joe’s continuously offers is an environment in which to practice embracing impermanence and non-attachment. Perhaps the next time I go I can think of the store as a Zen center where, instead of robes, folks wear Hawaiian shirts. Thanks for reading, Judith! I just made my own Fasolia Gigantes…didn’t taste quite the same, but still satisfying. The secret for taste to the Fasolatha is olive oil when making and a splash of lemon prior to eating. My family made this regularly when I was growing up and I continue the practice. Thanks, Hresula! I did use olive oil…next time I’ll try the lemon! The beans I used were canned, not dried, and much smaller than those in the jar. I’ll be keeping an eye out for big beans. If you have a recipe you’re willing to share, let me know.